On Sunday April 11th the Drummers Collective in New York City will team up with Hudson Music's Teacher Integration Program to present a full day of seminars, clinics and master classes tailored specifically for drumset teachers. Beginning at 9:30 a.m. and running until approximately 5:00 p.m., this is a rare opportunity to learn from and interact with many of the leading teachers and players of today. Attendance is very limited. Presentations by Tommy Igoe, Dom Famularo, Jeff Salem, Collective instructors Jason Gianni and Pete Retzlaff, as well as a lesson on the real Gladstone Technique by Arnie Lang. > -Anything you might want to talk about with our artists and your peers! For more information and to reserve your spot, contact Drummers Collective at 212-741-0091 ext 100. 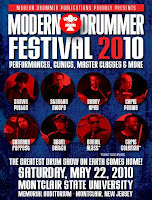 Modern Drummer Fest Lineup on May 22nd 2010, is now released.